Welcome to Burr Mobile Lifts! We are glad that you’ve chosen to visit our site today. If you have been looking through countless pages of platform lift manufacturers, searching high and low for your perfect match, look no further; you’ve found us! Burr Mobile Lifts is in the business of keeping the world accessible to everyone, no matter their mobility struggles. Get into your recreation and take to the road with ease using one of our electric platform lifts! Platform lift products from our company are made to cater to your every need. Our platform lifts are expertly constructed with strong and durable materials. They are also carefully wired so that they lift and lower smoothly and safely. Keep on reading to learn about some of the models and lift features available to you when you shop for mobility platform lifts with Burr. First, let us tell you about one of our most popular electric platform lifts, the Burr Handy-Lift! The Burr Handy-Lift is designed to help you get the most out of your vacation by reducing the time and the stress that go along with getting in and out of your recreational vehicle. 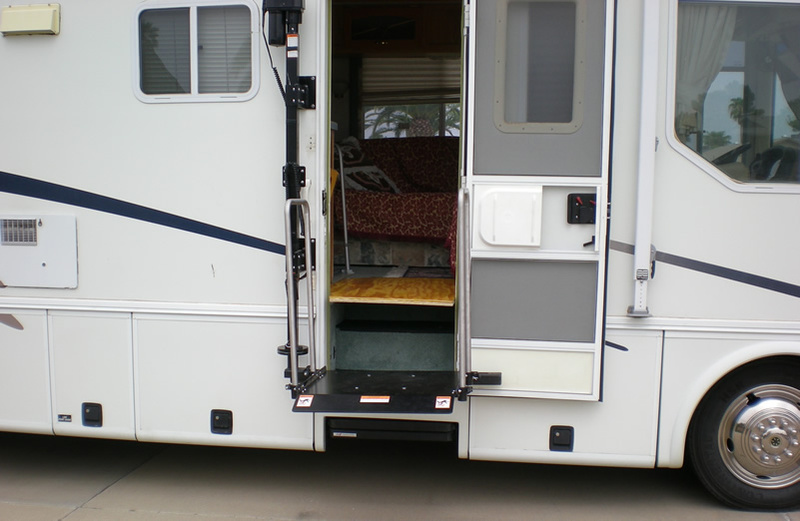 This mobility platform lift has many wonderful features, starting with a stainless steel assist handle, which allows you to feel confident and secure as you enter and exit your RV. In addition, when you have been successfully raised to or lowered from your vehicle, the Handy-Lift can be folded down and tucked away. To control the movement of your roomy 25”x26” mobile platform lift, you or your travel partner can use one of the two wireless remote control fobs that we provide you. The fobs allow you to ascend and descend in increments and at speeds that are comfortable for you. Our priorities are not only ensuring your health and safety, but also helping you curate a renewed sense of independence and autonomy. That’s why our platform lifts, which are constructed from plated steel, stainless steel and aluminum, are available in special and custom exterior colors. Call us to learn more! Listed below are some of the features that make the Handy-Lift such an asset to the adventurer that doesn’t want to be slowed down. Another one of our empowering platform lift products is the Burr Mobile-Lift. This particular is mobility platform lift is designed for the on the go scooter or wheelchair user. It allows for the safe lifting and lowering of your scooter or wheelchair to and from a vehicle trailer. It allows for the lifting and lowering of three and four-wheel scooters OR two and four-wheel wheelchairs of up to 300 pounds. With the Mobile-Lift, traveling has never been so easy! To install your new mobile platform lift, simply bolt it onto a class 3 receiver hitch. When you’re ready to put it away, all you have to do is unbolt it and put it away; it folds up for easy storage! To safely lift your scooter or wheelchair, first drive it onto the platform and lock its brake or brakes. Then, push the lift’s switch to raise the platform about halfway. At the halfway point, pause the lift briefly and attach the adjustable safety belts we provide securely around your scooter. After that, push the switch again and let the platform lift the rest of the way. For your convenience, when it reaches the top, it will lock in place and you will be able to drive off, just like that. It takes just sixty seconds! This mobile platform lift is easy to install and store, simple to use, lightweight and attractive. For evening usage and handling after dark, the Burr Mobile-Lift even comes with a “Nite-Light,” as well as a D.O.T approved center brake light. Check out some more specifics of this product below. Our aim is to make things easy for you from start to finish, which is why, when you order platform lift products from Burr, we ship directly to your door via UPS or freight. All products come with a one-year warranty that is valid from the date of purchase. All of our platform lifts are delivered with a detailed set of installation instructions. However, if you would prefer the assistance of a professional installation company, please reference our list of recommended installers, which can be found here: https://www.mobile-lifts.com/quote/. Though we are based in Michigan, this list features installers located all over the United States, as well as one in Canada. Here at Burr Mobile Lifts, we pride ourselves on being platform lift manufacturers who care. We know that for our customers, our platform lift products mean more than just convenience or speed; they represent freedom. They mean that you can live your life to the fullest no matter your circumstances. That’s why, for over 25 years now, we’ve constructed our electric platform lifts with only the strongest, most reliable materials using proven methods of fabrication and assembly. That’s also why we always make sure to conduct quality control tests on not only the physical components of our platform lift products, but the electronic and mechanical components as well. Your safety and satisfaction mean the world to us. If you’ve been letting a handicap or limited mobility hold you back, please get in contact with us! We want to craft an amazing electric platform lift for you. To get started, request a quote here: https://www.mobile-lifts.com/quote/, email us here: sales@mobile-lifts.com, call us here: (269) 966-3122 or fax us here: (269) 965-2389.